The large, powerful sea-god Poseidon’s right hand rests upon the body of a shark. His other arm is outstretched and the hand’s palm is downward, suggesting his control of the waves and all within his reach. Fredericks unites Poseidon with familiar creatures of the sea: porpoise, sturgeons, and tortoise to suggest the union of this god and his minions. 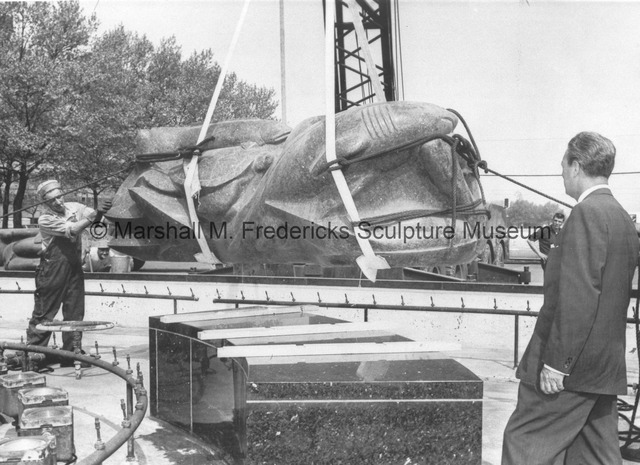 “Marshall Fredericks watches the installation of "Nordic Civilization" at the "Cleveland War Memorial: Fountain of Eternal Life" site,” Marshall M. Fredericks Sculpture Museum, accessed April 19, 2019, http://omeka.svsu.edu/items/show/946.